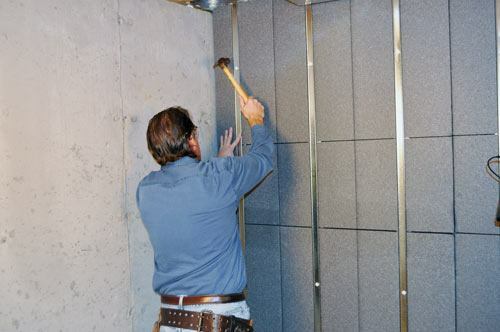 Installing Basement-to-Beautiful® wall panels provides you with waterproof wall framing and insulation in a single step. Transforming an unfinished basement into a finished living space is a great way for any family to gain extra room. However, basement conditions demand different construction materials than those used upstairs. 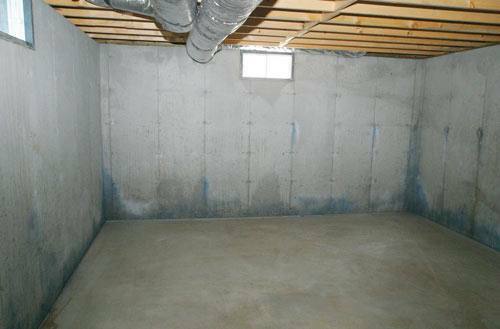 As certain “above-grade” materials can cause major problems when used in the basement because of higher moisture levels. As easy as 1-2-3. 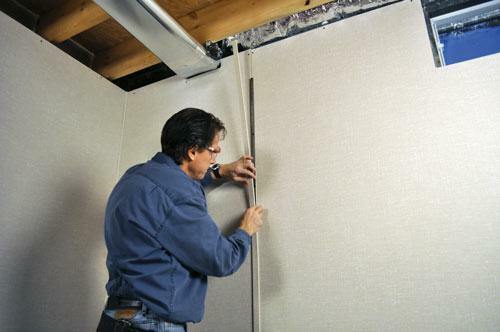 Basement-to-Beautiful panels prepare your basement walls for finishing like no other product. Don’t build new basement walls with wood studs and fiberglass insulation! 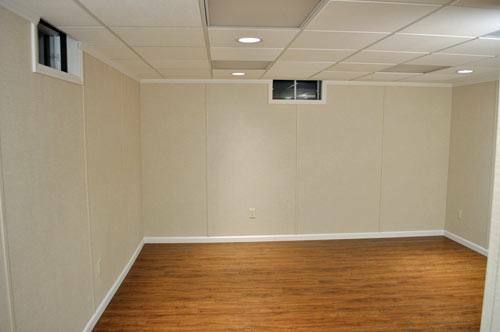 Basement to Beautiful® Wall Paneling is only available from a certified installer in your area. Contact us to request an inspection & get a free estimate to have it installed in your home. Wood framing and fiberglass insulation are fine in above-grade applications. But wood absorbs moisture in the basement because of high humidity levels or from water that gets onto the basement floor. Wood that stays wet for a prolonged period of time creates a perfect habitat for both mold and wood rot; which can eventually destroy organic materials, while creating nasty odors and hazardous mold spores along the way. Fluffy fiberglass fares no better when moisture is present; as it compresses into wet clumps, falls out of place, and totally loses its insulating value. Moisture-proof materials to the rescue! Yes, there are alternatives to wood, fiberglass and other organic materials that don’t last long in the basement. 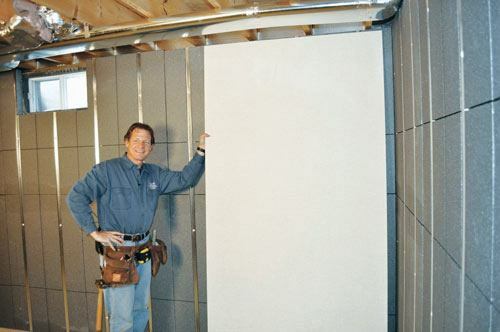 Basement-to-Beautiful wall panels are designed specifically to install in the basement, against foundation walls. These innovative panels enable your contractor to complete wall framing and insulating in a single step. More importantly, Basement-to-Beautiful panels can’t rot, attract mold or be damaged by moisture –even if your basement happens to flood. Basement-to-Beautiful Wall Panels have all the right features! Check out the panel profile. This cross section through a B2B panel shows one of the wiring channels and two integral studs. Because the studs don’t extend fully through the panel’s 2 ½-in. thickness, thermal bridging is avoided. Zero wood or organic content to attract mold and rot. Designed specifically for basements, these panels will stand up to the toughest conditions –even a basement flood. You’ll never have to worry about mold, wood rot, nasty odors or soggy insulation. Integral steel studs for attaching finished wallboard. The studs provide a broad flange to secure your finished wall materials. 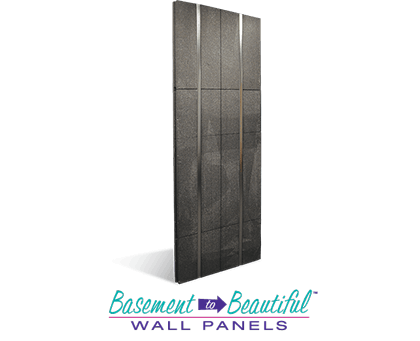 ZenWall® from Basement Systems is an excellent finished wall system to use with B2B panels. Don’t worry; ZenWall™ is also totally waterproof. 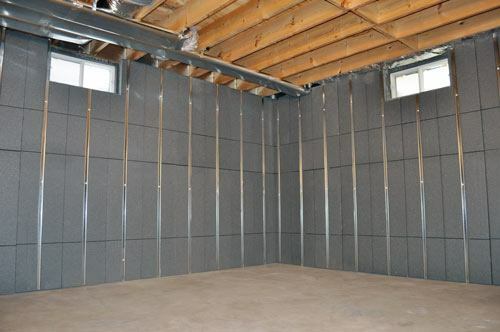 Rigid foam insulation offers unmatched durability for the basement, as it can’t be damaged by moisture or mold, and never falls out of place or loses R-value. Built-in wiring channels to simplify running electrical wires. There’s no need to drill holes through studs or snake through framing and fiberglass insulation. Horizontal and vertical wiring channels make the job easy for your electrician. Superior energy efficiency with the SilverGlo® foam board. This special graphite-infused foam has higher R-value than standard foam. A completed Basement-to-Beautiful installation creates a continuous blanket of R-13 insulation to make your basement comfortable and energy efficient. 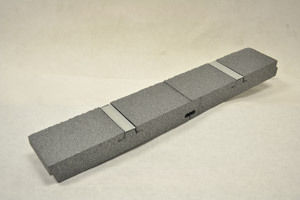 A narrow profile maximizes your basement floor area and simplifies installation. Basement-to-beautiful panels are just 2½ in. thick; that’s a full inch thinner than a standard 2x4 wall. Spray foam adhesive and special plastic fasteners are used to secure the panels to basement walls. Do it right the first time with Basement-to-Beautiful wall panels. Thinking about finishing the basement? Or is the fiberglass insulation beginning to sag in the basement? If so, contact your local Basement Systems dealer today for a free basement inspection and Free Estimate to install this innovative and waterproof basement pre-finishing system.